Lulingu, South Kivu, in the turbulent east of Democratic Republic of Congo (DRC), is a region of few roads and dense forests, whose 170,000 inhabitants are regularly forced to flee at the whim of armed groups. For the past 20 years, this region of 6,500 square km has been immersed in violence. When the fighting comes close, villagers take refuge in the forest. When the armed men have moved on, they return to their villages and fields to see what has been left standing, and to start rebuilding and replanting what they have lost. "This is why we can’t tend our fields. When we’re able to return, either the crops have spoiled, or they’ve destroyed or burnt it all"
For people who make their living from farming or livestock and who depend on the land, the constant need to flee and return, to start again from scratch and then flee again, means that just surviving is a struggle. “When we are hiding in the forest, finding enough to eat is a problem,” says Kaburiwazi, a 30-year-old miner from Ngola. “We have to go to other villages to find food to eat. With all of the security problems, we’ve not been able to harvest our crops. Now that everything is a little calmer, we’re all hoping to harvest in January.” To help displaced people in this remote area, Médecins Sans Frontières recently organised a distribution of aid in eight villages between Nduma and Makala. Nduma and its surrounding villages are inaccessible by road. 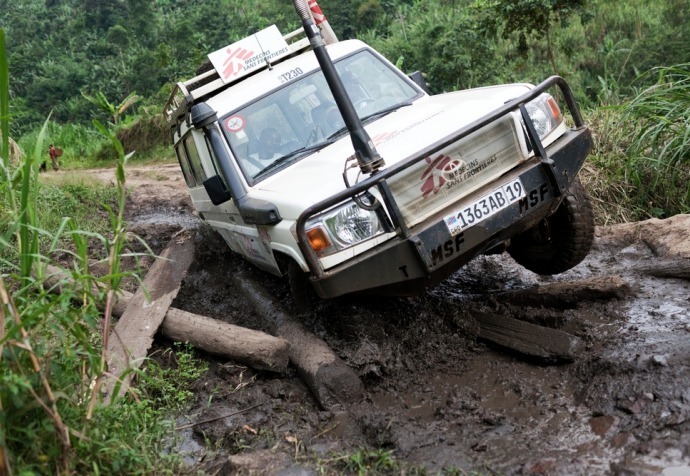 Unable to use four-wheeled vehicles, Médecins Sans Frontières teams took to two wheels, transporting the aid on the back of 30 motorcycles – an operation which took 12 days. They provided 519 families with essentials including mosquito nets, jerry cans, kitchen utensils, soap, blankets, mats, clothing, fabric and farming tools. Being regularly forced from home by violence makes normal life impossible. Displaced people have nothing they can rely on: no regular meals, no schools for their children, no jobs, nowhere to sleep, no access to medical services. This makes them extremely vulnerable and at a high risk of contracting illnesses. “Before, when you fell ill, you expected never to be cured,” says Kaburiwazi. That has changed, as Médecins Sans Frontières is now renovating the community health centre in Makala, where it has already started offering free medical services.